The reservations people were helpful and knowledgeable. This home seemed much bigger than its two bedrooms would suggest. It was in a great, quiet location (nice view of the foothills and bit of the lake) that was also convenient to the trails and eating spots. The home was bright and inviting, with a restful master bedroom. It was the perfect spot to relax after a day outdoors! We love to get one of the rentals have been for over 17 years used to be under Cole but now booking under Stroh. We love it there and will always book at least once a year. I just returned to work and have already showed several people pictures and recommended going there. We always get friendly staff when we have issues and always willing to help me if needed. What a great team and all is great!!! Loved that cabin and have stayed there a couple of other times. Great location and this rental has everything plus to make our stay great. The kids loved that there was toys and books and I didnt need anything more for cooking. Great vacation and great rental. We are already planning our next year trip but want to stay longer. Your team, and especially Jada, is first rate. We loved the level of attentive service and the personal touches. We had a fantastic return stay at #21, the aptly named "The View". One could spend an entire week just soaking up the view from the living room. It was perfect in every regard. Easy in and out. We did arrive about 3:45 but the door lock didn't work until exactly 4. I could have called. Had a great get away. Had minimal contact with team, but every experience was positive and knowledgeable. Property is well maintained, website left little to the imagination and was exactly as advertised. We want to make it an annual stay. The size and layout of the property we stayed at (#49) was so well laid out and perfect for our three family group. We loved everything about it. We loved our stay! We definitely are coming back. The only thing that could have been better is we came early and were told it was ok to come in at 3:00, but we weren't able to get into the door with the key pad. Fortunately, some other doors had been left unlocked for us, so we did figure out how to get in, but not until we had tried several times to use the key pad in vain. It would have been nice to have gotten a call telling us that since we were coming at 3:00 instead of 4:00 that the pad would be unusable and we were to get in another way. It all worked out fine, but was a bit frustrating to not have the code work and a bit anxiety producing. Otherwise, everything was fabulous! Loved it. Thank you! When I called to make the arrangements, the team member was very nice and helped me find the perfect place to stay. It was a nice place to stay. It had everything we needed and it was quiet and clean. 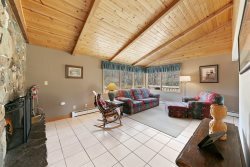 We have rented through Wallowa Lake Vacation Rentals for over 16 years. We love coming up to visit. There were paddle boards in the garage but only for owners. As this sport becomes more popular, I love to see them included at the rate of $260/night that we pay. The service was great, and the woman we talked to was friendly, fun and helpful. Thank you- it could not have been better! The support team was fabulous. WiFi and cable issues were the only blemish on a great vacation but were repaired while we were there. We absolutely love this house !!!! Million dollar view !!!!!!! I have booked through Wallowa Lake Vacation Rentals numerous times and any of the team I have spoken too have always been very helpful and very friendly. This cabin (Time Out #55) was perfect for just my sister and I, the layout was great and the amenities were just what we needed. The view from the living room was so soothing and the gazebo was perfect as it rained while we were there but we were still able to enjoy the outdoors. We will be coming back to this cabin for sure! We enjoyed our "time out", at the lake!! Always hate to see it come to an end!